Im looking to buy a nice set of stud earrings for my girlfriend and not sure where I should shop. For a name brand store, it seems like Zales offers the best value but Im not sure if I should buy it from Zales. "Value" means different things to different people. Speaking as a consumer, I don't find most mall-based jewellery chains "good value" because to me having a lot of indifferent quality, mass-produced jewellery in ready stock and having an outlet in nearly every shopping mall are of no value. Many, many people buy there precisely because they value these things: there is a lot of (apparent) choice, they can come out of the store with what they want right now and there is a branch nearby even if they move. What is it that you "value" in buying the earrings? Ease and convenience of shopping? Price? Quality of stones and metalwork? Speed in delivery? Variety of designs and stones available? Delivery is not a problem with most shops. Define quality, though - for example, what size earrings (diamonds) do you have in mind? Unfortunately I dont even know how to judge "quality" when it comes to diamonds. I suppose the best karat and weight combo. My girlfriend likes diamonds and white gold. Ummm - at $3-500 budget, with diamonds they are going to be quite small - think 2 or 3 mm stones. Would you consider for example diamond simulants? Im not too sure if I want to go with a diamond simulant but I dont know much about them either. I dont earn a lot of money so I cant afford anything over $500. Nothing wrong with either one, even though they're I2-I3, which means, that the inclusions will be clearly visible to the naked eye. The advantage you have, is that people don't usually tend to get very close to studs to inspect them (unlike an engagement ring, for example). Yea I would love to have more money to spend so that I can get something with higher clarity but I may have to settle for something like this. Would you guys say weight is more important than clarity? 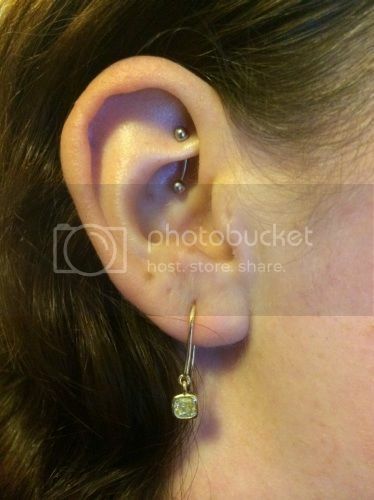 And how much more would I have to spend for a similar earring with clarity that is a notch higher? If you want to stay in your price range, the weight, in my opinion, is more important. 0.25ct each is a nice size...going smaller will make the studs much harder to see. A notch or two higher in clarity will make very little difference to the look. Quite honestly, I'd stay away from anything that is graded I2-I3. This is the point where inclusions start to affect brightness... so I'm not sure that a notch or two in clarity from I2 will make very little difference. Back to Blue Nile, they have a pair of 1/2 ctw for $660: http://www.bluenile.com/hk/diamond-14k-white-gold-stud-earrings_27765?track=po and they are minimum I1. Slightly higher is a tricky issue. The scale goes up to terribly expensive and 'slightly' is in the eyes of the beholder. I'm not actually a fan of pushing the limit on budgets for this sort of thing. Pay what you can afford. That said, $300 is on the low end of the diamond business and I personally would consider the I2's clarity range in order get the size up but I second the idea suggestion of considering simulants. If you're metal is going to be gold or white gold, the parts and labor are going to be about $100 or more of your cost so we've only got $100 each left for the diamonds. that's tight but possible. Talk to one of the small 'Mom and Pop' type of jeweler and see what they have in stock. These aren't hard to set up and they may have some stones in their repair stash that they can sell you for a good price. I would avoid the chains and, frankly, I would avoid what's already in the showcase. Find a place where you can talk to the owner directly. About 600.- for the stones + 100.- for the work. Voila! Hey guys, I've been working and saving my money over the past few months. Her birthday is coming up in a few weeks and I am getting ready to make my decision and purchase. I have a limit of $800 and want to get her the best studs possible. I'm trying to balance carat, color level, cut and clarity. It seems like most people think the carat weight is most important, followed by clarity. I hear very little about color and cut level though. It's actually on sale for $500 right now and I like it but is the I color level something I should stay away from? Is there a huge difference between an E and an I? .26ct seems kind of light, no? In a 0.25 size or thereabouts, once set, you'll have problems saying what is a (fairly graded) E from a (fairly graded) I. Side note on colour and cut: I doubt you'll find any of the regular posters on this forum or any other forum discussing diamonds and gemstones saying cut and colour are not important. If anything you'll find them saying the opposite. However, the issue is that at certain budget levels size and clarity tend to dominate: you want to see the diamond (size) and you don't want to see too many inclusions in it (clarity). This said - you need to be realistic about how much diamonds and jewellery in general cost. I still think that at your budget you'd be better served by not getting diamonds but other stones. Now, I would consider the last one even though it's over my budget. I'm leaning towards the last 2 as I want a 3/4 ct, unless the clarity & color would look bad in a 3/4 ct (as it's more difficult to see flaws in 1/2 ct). I know you guys prefer Blue Nile over Zales (and other mall jewelers) but is the 3rd earring that much better than the 2nd? Thanks again. She's a very special girl to me and I want to get her something she would love to wear for the rest of her life. Put it this way: the "equivalent" Zales to the more expensive of the two Blue Nile options is $1349 (http://www.zales.com/product/index.jsp?productId=3357734&locale=en_US) since they guarantee clarity to be no worse than SI2, whereas in the "cheap" option there is no lower bound on clarity (meaning you'll get I2-I3 stones). Blue Nile base clarity is at I1, but the base colour is I vs. Zales's I-J (which means "J" at best). Add to this the fact that I don't particularly trust Zales's own grading... and the choice is easy. FWIW, I'd go with the "smaller" option. Bear in mind that a typical 0.25 will be just above 4 mm, but a 0.35-0.40 will only be 0.5 mm more. Put the money in getting her a nice evening out - she will value the gift because you are making it, not because it is larger. Blue Nile it is then. Neither of the 2 from Blue Nile are .25 though. They are .5 and .75 respectively. I really want to get her the .75. So do you think the .75 one from Blue NIle is worth it? 1) You are confusing total carat weight with the weight of each stone. 0.50 cttw is about 0.25 for each stone (and 0.75 is somewhere between 0.35 and 0.40 each). As to whether it's worth it, see my previous post. 2) The eBay offer - leave well alone. In most cases you get what you pay for; sometimes less. Hi Anny, why don't you go and spam somewhere else? How about non-diamond earrings? Maybe they are not so valuable, but they can be meaningful too.